All GTO mounts produced since 1998 can be easily upgraded!!! All new, completely redesigned with modern chip technology resulting in faster processing speed and increased memory capacity for future feature additions. GTOCP4 supports floating point operands to improve calculation accuracy and coordinate conversions. Direct download of future firmware updates for the GTOCP4 (very quick and easy) as well as the Keypad. USB 2.0. Ruggedized version is rated for very warm and cold temperatures and is dust tight and water resistant. Note: You must install the FTDI driver on your computer BEFORE connecting via USB. The FTDI VCP driver is found at this site: http://www.ftdichip.com/Drivers/VCP.htm Select the Windows driver under "Comments" all the way to the right of the table. The driver is the "setup executable" link. See this PDF for driver location. Ethernet can be point-to-point w/PC or networked without user configuration. Simply enter the IP address into the browser URL and gain access to the GTOCP4 Web interface. This will provide easy configuration of your Ethernet and WiFi connections and upload of firmware updates. Additionally, since the Web interface is built into the GTOCP4, you can access it on any operating system that supports a Web browser without having to install any special software. Astro-Physics APCC Standard and Pro version software. Version 1.5 or later has built-in Ethernet support. Connect APCC directly and then use its built-in virtual serial ports for other software. The AP V2 ASCOM driver will continue to be connected through APCC's virtual ports. Please refer to the information below regarding our special APCC pricing. ASCOM driver. Version 5.20 or later has built-in Ethernet support. WiFi to enable connection of your mobile devices or PC to control your mount. Can be point-to-point for field use, or connected to a WiFi network. Specify your preference and turn the options on or off within the GTOCP4 browser interface. RS-232 ports. We retained both RS-232 ports for those accustomed to this dependable mode of operation. Note that the lower port is now fully functional. Integrates all functions of the Absolute Encoders and the Precision Encoders and mechanical Limit Switches. Secondary boxes are not utilized. This results in faster response rate when guiding. Applies Safety Slew logic to all slew commands regardless of source - Keypad or any computer program. This ensures that your mount will slew safely from a counterweight up position or into a counterweight up position while using the meridian delay feature. 12V - 24V DC power. Servo control system operates from a readily available 12-volt source, so it can run for long periods in the field. It is compatible with standard automotive or marine batteries. You will need to purchase a Powerpole Cable designed for this control box. Backward Compatibility. All of this in a compact size that fits all previous GTO mounts. Adapters may be required. Includes features from the latest version of the GTOCP3 that you rely on. Allows use of APCC software. The Astro-Physics Command Center (APCC) requires either the CP4 control box or the CP3 control box with the V2 chip installed. Allows Automatic "Deadman Switch" Safety Timer function. This feature confirms that mount is communicating with the PC and COMs are functioning properly. If not, the mount will park at the end of a user-defined countdown preventing pier crash. This important safety feature is implemented in both APCC Standard and Pro Versions. Reads capability of PEM state, guide, center and slew rates and of drift (both axes) and trim (both axes). This feature is implemented through polled status command in the ASCOM V2 driver and APCC Standard and Pro Versions. Allows Auto-Park. This will cause the mount to enter a parked state whenever power is removed and this state is remembered through power cycles. When the command is invoked, default sidereal rotation will NOT start up the moment that power is applied. This will be the recommended setting for any remote observer/imagers. This does NOT try to move the mount into a pre-defined park position. It simply puts it into a parked state when power is removed. This feature is the default in APCC Standard and Pro Versions.. Improved Meridian Delay logic. The new logic is more streamlined and robust. It is applied to all go-to slew input - Keypad and computer programs. Accepts timed guide move command. This allows control programs to introduce precise motion without the complication of providing accurate time separation between the move and quit commands. Using your guiding software through the ASCOM AP V2 driver takes full advantage of this feature. Allows variable tracking rate commands in both RA and Dec axes. These are useful for tracking objects that are not fixed relative to background stars, like comets, asteroids, satellites and the Moon. Accepts variable centering rate commands. In addition to the commanded rates of 0.25x, 0.5x, 1x, 12x and 64x. Variable rate commands are available in the APCC Standard and Pro Versions. PEM - Periodic Error Memory correction. Make your correction just once, remains in memory permanently. PEM memory command. PEM memory is accessible to external software programs in order to smooth out and modify the curve. PEMPro by Ray Gralak and distributed by CCDWare (included with 1100 and 1600 mounts) supports directly reading from/writing to the PE storage locations. This allows more accurate programming of the mount's PEM (that is, the mount does not have to interpret move or autoguider commands). Also, programming is significantly quicker than waiting for one worm cycle's worth of playback (5.6 to 7.5 min, depending on the mount model) as is the case for the GTOCP2. Also, PEMPro reads parameters and calculates the mount's worm period (useful if you have a non-Astro-Physics mount with the GTO Control System. Alt-Azimuth coordinates. Servo control can be commanded using Alt-Azimuth coordinates. Utilized by the Keypad, APCC Standard and Pro and through our ASCOM V2 driver if the software sends alt-az commands. Park command de-energizes motor and remembers R.A./Dec. coordinates when power is removed. Restores saved R.A./Dec. coordinates on next power up and calibrates to them when commanded. When the power and keypad are restored, the mount will stay parked and not resume tracking until the Resume from Park function has been entered on the keypad. Re-calibration. Allows re-calibration even when scope has crossed the meridian and is on the wrong side of the mount. Motor stall protection. If motor stalls more than 1 second, the drive will shut off. This is a safety feature to prevent motor burnout in case of severe load on the motor due to an extreme imbalance condition or if the power to the mount has been accidentally left on and the scope has hit a hard stop. Automatic meridian swapping in GoTo slewing mode. Continues to track at sidereal rate, even while slewing. Assures position is always accurate. Allows E-W reversal in R.A. and N-S reversal in declination. For correct object orientation and movement in eyepiece. Provides full functionality of the AP V2 ASCOM Driver and APCC. Provides all the commands required for all functions of the AP V2 ASCOM driver (available free of charge) and our Astro-Physics Command Center (APCC) software (optional purchase). Features that are NOT Included That We Hope You Don't Miss. Connections: Reticle, Focus and 6V Auxiliary Power. These are not widely used any longer. Does not have R.A. and Declination backlash control. This was initially designed for manual guiding. Curious about the feature comparison between the GTOCP1, GTOCP2, GTOCP3 and GTOCP4? Check out our Control Box Comparison chart. Two 9-pin RS-232 serial ports (DB9 female receptacles, a.k.a. DE9). If you use APCC Standard or Pro and your computer connectivity is flakey, you can use one of these RS-232 ports as a backup to your USB or Ethernet connections. If the signal is dropped through your primary input, the serial cable will fill in. Both ports are full-speed. The command language protocol that is programmed into the micro controller of the GTOCP4 Control box allows the sophisticated control functions of your mount. Please keep in mind that the software that communicates with the mount will determine which commands are utilized. For instance, although the control box is programmed to include a command that can implement a timed guide move, if the software does not issue the command, this feature cannot be used. For optimum utilization of the advanced functions in the command language protocol, we recommend that you control your mount with either software that utilizes the ASCOM V2 driver or the Astro-Physics Command Center (APCC). All of these control options were written by Astro-Physics. For more information, see: Control Your GTO Mounts with Your Keypad, Computer or Mobile Smart Devices. Can My Mount Be Upgraded? The good news is that all GTO mounts that we have produced since 1998 can upgrade to the new GTOCP4!! 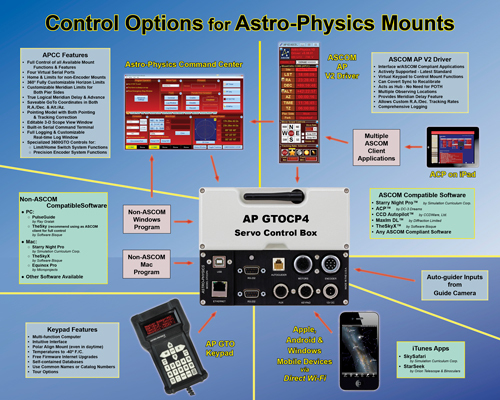 All orders for the GTOCP4 Control Box must be placed directly with Astro-Physics, except for customers who ordered their mount from one of our international dealers. Read the GTOCP4 Upgrade and Installation Guide (PDF document) in order to learn how the CP4 will attach to the mount that you already own and which parts you will need to order. Prepare the required information: Each control box must be configured for the specific mount based on the characteristics (also referred to as "personality") of that mount. Please be prepared to provide the information when you place your order. You do not have to send the form, we can complete it with information provided on the phone. Order the parts that you need. Refer to the Upgrade and Installation Guide mentioned above to determine what you need for your mount. Remember that all GTOCP4 control boxes will require a new power cable since the connector is different than previous control boxes.